The humble home office desk and chair have come along way. Now we have adjustable ergonomically designed swivel chairs that do everything but make the coffee. In fact, it can't be too long before we get a smartchair - an iChair - that can control the coffee machine. But, as it turns out, making yourself as comfortable and supported (in all the right places) may not be as good for you as it seems. In fact, the less our bodies have to do the weaker they can become and more susceptible to injury and other problems. Recently, there has been a move away from extreme support to more alternative type seating arrangements that do everything from build core muscles and strengthening the lower back, to a full workout - all while you work. Sitting all day is simply not good for you. Recently adjustable worktops have become popular because they provide the freedom to choose between sitting and standing. For anyone who gets aches and pains in their neck and shoulders from sitting at a desk all day, these are probably a great option to consider. This lightweight desk riser converts an existing traditional (seated) home office desk into a stand up desk. It offers ample work space and 12 different height levels to suit anyone. Has received 5 out of 5 star reviews from existing customers (which is important for a product with working parts that might otherwise break on poor quality alternatively). Need something a bit sturdier and want a bit of luxury while standing at your desk? This electric version comes with wheels for easy movement around the house (say, if you need to keep an eye on the garden sprinklers while you work) but also has an electric pushbutton that adjusts from sitting to standing in 20 seconds. Standing motionless for a long time can be uncomfortable. The body needs a bit of movement to prevent muscles and joints from becoming tired. A bit of low-impact movement is perfect for working those stabilising muscles. A low cost, comfy swivel chair that's nothing too fancy, would go perfectly with your sit/stand desk. You're not going to be sitting on it much so why waste money on an expensive chair? Not everyone, myself included, has the space, money or inclination to sit at a majestic walnut office desk with plush finishes and trimmings and a price tag to match. Sometimes a small, attractive work space that doesn't take too much room is a far better option. So this is about the lowest cost computer desk I could find. It does require a bit of assembly, but has a kind of simple charm to it that I find attractive. Others must do too because it's been review more than 900 times, which means it is definitely a popular item. If all you really need is a spot to put your PC or laptop then this funky little orange and white desk... well, desk frame really, is perfect. Light on cost and thrifty with space. Popular and well reviewed. Plus it comes in range of bright colors, like pink, purple, red and green. But who doesn't like a splash of orange to brighten their day, right? Still very compact, but perhaps a bit more stylish and sturdy than the other desks in this section. The design definitely suits a more modern interior work space and the black glass table top would go well with brushed metal accessories like a desk lamp. Balance balls are a great way to avoid lower back pain that comes from sitting all day. Using one of these as your office chair will cause a bit of stifness and discomfort initially (while your muscles adjust to the work of stabilising your body), but once your core and back muscles are strong enough you'll be much happier and healthier. My personal favourite is the L-shaped desk because I find that traditional desks either don't have enough surface area for my two screens and everything else I need, or they are too long for me to reach everything. With an L-shaped desk and a swivel chair, everything is at a convenient arm's length away. Plus they look cool. So this is a little bit tougher on the wallet, but at under $400 it represents excellent value and offers a contemporary style with an attractive white finish. It does require assembly, but with nearly 90 reviews at an average of 4 out of 5 stars you don't have to worry about missing pieces. I like the white, but this desk comes in a variety of finishes including natural wood (dark and light) and dark capuccino. Again, we can't resist the modern white and glass finishings on this desk. Perfect as a casual workspace in a light, breezy space - preferably your summer beach cottage. It has a modular design, which requires some assembly. Again, highly reviewed with over 4 out of 5 stars means that you can be sure of a decent quality product. Go on. You've already seen two modern L-shaped desks with white finishing. 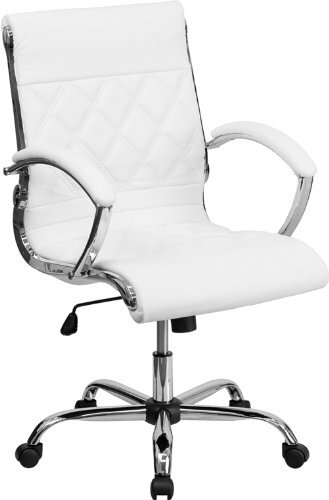 Why not complete the set with this stylish white executive swivel chair? Comes with some snazzy features including knee-tilt locking control and tilt tension control. Not into white or glass? How about a modern steel and wood frame with plenty of work space packed into a space saving, economical L-shaped design? Ample space for a PC and laptop as well as plenty of other office accessories means all your gadgets are sure to fit conveniently around you while you work in style. Do you spend time cutting, pasting, drawing, or generally moving stuff around? This desk has a commercial grade, durable 1-inch surface that is resistant to scratches, stains and burns - great for anyone who works with more than just a laptop or PC. The perfect desk for designers and anyone else who works with their hands (but not with welding equipment). Over 50 reviews with an average of 4 out of 5 stars means you're getting good quality. There's a lot to be said for having a pleasant and beautiful workspace that makes you comfortable, happy and relaxed whenever you're there. A good work environment can mean the difference between toughing it out when times are bad... or throwing in the towel. Not to mention, client-facing roles often mean you need to have a presentable and professional office space to give lend credibility in the eyes of potential partners, investors and clients. For those time when an L-shaped desk is simply not enough and you have to immerse yourself in work completely, this u-shaped desk will place everything you need all around you. Stylish, high quality wear-resistant laminate finishing give this piece longevity - and, in fact, it comes with a 9 year guarantee on all orders. A bit of style an luxury with this espresso and brown-red finish hardwood solid and veneer desk that comes with felt-lined top drawers. Boasts an array of convenient features like locking draws, sliding glides, a powerstrip, drop-front keyboard drawers and a bookcase with three shelves. Has garnered an incredible rating of 4.5 stars out of 5 from over 30 customers. Hardwood solids an veneers with a distressed finish give this desk a unique style that's all its own. Backed by a 5 year warranty and no interest if paid off within 12 months it's a great deal for someone looking to upgrade their workspace. What's nice about this piece is that it comes in both left and right L-shape orientation, so you can choose the option that best fits your office layout. Of course, if you're considering buying a nice office desk then it just wouldn't be complete without a proper chair to match. Enter the Herman Miller Task Chair that comes in a range of colors and a seriously impressive list of features. Do you find chairs make you too hot and sweaty at times? Not this one - it dissipates heat while you work. The design takes pressure off your thighs helping blood to circulate allowing you to stay focused for longer. Also comes with an impressive 12 year warranty and has over 4.5 stars from a sizeable 330 reviews and gets my vote as the one high-end luxury office item that is more likely to save you money in the long run by offering exceptional overall quality and value for money. Desks and chairs aren't the only things we need to have a functional workplace. There are quite a few other gadgets and accessories required to keep things running (no pun intended) smoothly. Ok, so walking while you work might not be suitable for everyone. But this treadmill desk has racked up over four and half stars in reviews from over 200 people - so clearly a lot of people are serious about staying fit while they work. With a lifetime warranty on the frame, a three year warranty on the motor and additional parts and labor warranties this treadmill will keep you looking fit and trim while staying competitive in the workplace. If walking on a treadmill while you work isn't your thing then how about cycling while you work? Bikes are low impact because they aren't load bearing exercise, but they still pack a punch in terms of offering a great cardio workout. Durable and quiet, this desk exercise bike comes with an adjustable seat and over a thousand glowing customer reviews. I don't like cabinets and closed shelves. I find that they cut off books and folders from convenient access. It is much easier to have the books stored neatly without a door in-between. 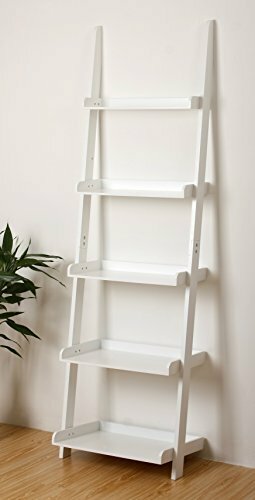 Bookcase ladders are modern and functional, easy to move around and assemble and can pack a surprising amount of books into a fairly small floor space. Not widely considered to be the poster child of interior design, and not all that exciting to talk about either. The humble office bin is nevertheless a vital part of a functioning office - take it from one who had to walk to the kitchen to throw anything away (after losing the office bin during a move). Coming in at under $10, this attractive wire mesh bin is a no-brainer. Think of a built-in surge protector as insurance. It's something you wish you didn't have to pay, but when you need it you're super glad you got it. And let's be honest, at a touch over $9 it's worth it to protect all your electronics in the event there is a disruption to the power supply. Don't say I didn't warn you. With four lighting modes and five levels of brightness, not to mention an eye-friendly LED bulb with 25 years normal use warranty and super flexible and adjustable swivel stand, you can be sure of getting the perfect light. Energy efficient and USB charged with an automatic off feature and over four and a half stars out of five from more than 2 500 reviewers makes this a must have home office accessory. So that's what we think you should consider when buying stuff to kit out your home office. What other office furniture & accessories do you think are absolutely necessary? Have you used any of the products covered here? Share your thoughts in the comments.